Jen’s outdated plush brocade slipcover is a thing of the past. 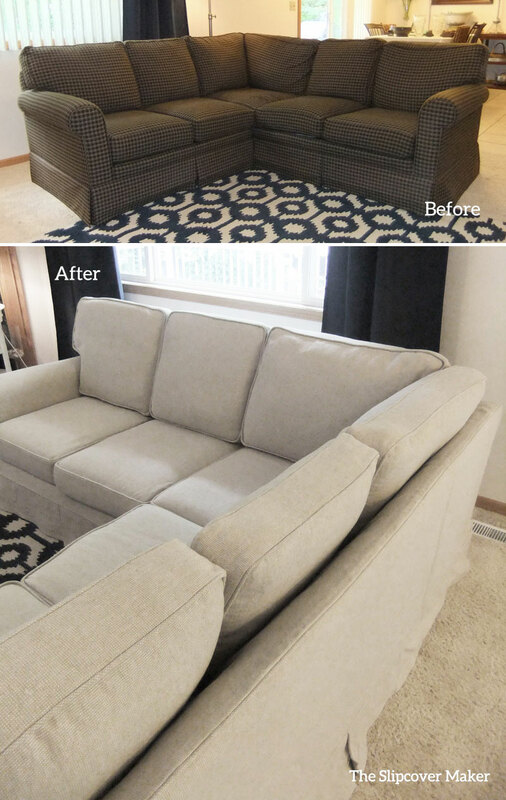 Now, her sectional has an entirely new look with a Khaki denim slipcover. Looking fabulous especially with her pretty mix of patterned and textured accessories. Even her protective doggie blankets fit right in! 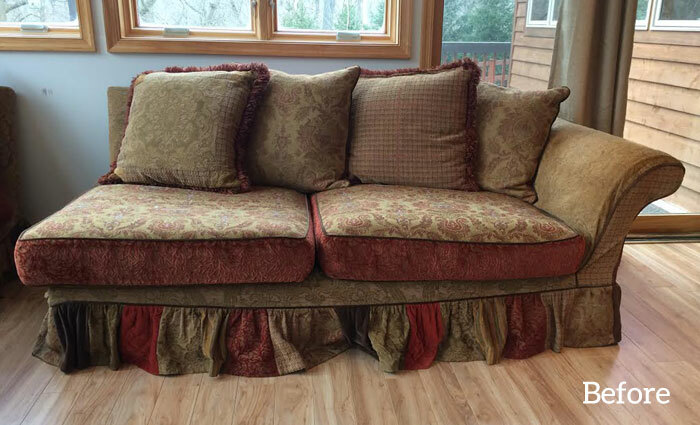 This project was a slipcover replacement. Jen sent me her old covers to copy and update. I changed the gathered skirt to a tailored style for cleaner lines. This entry was posted in denim slipcovers, sectional slipcovers, slipcover copy and tagged khaki denim slipcovers on May 9, 2017 by slipcovermaker. If you like the idea of a relaxed linen slipcover but don’t want a lot of wrinkle this linen and cotton fabric is a good alternative. 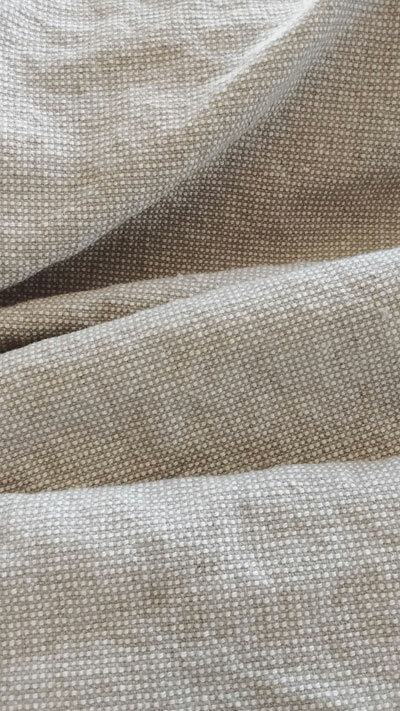 It’s a thick yet supple cloth featuring a tiny box texture that shows off both the un-dyed flax and natural cotton color. Slubs and nubs are part of its charm. The look is more rustic than refined — think casual farmhouse style. High shrinkage. It shrinks 5″ on a one yard length and 3″ on the width. Pre-shrink your yardage in jumbo size washers and driers before you make your slipcover and you’re good to go. Heavy weight. Sewing multiple layers will require an industrial machine. For projects with simple seams and few layers this fabric will feed through a home sewing machine just fine. Slight give. Fabric eases out a bit when sewing and probably will to the same with wear. Start with a snug slipcover fit and control the give as you sew for best results. 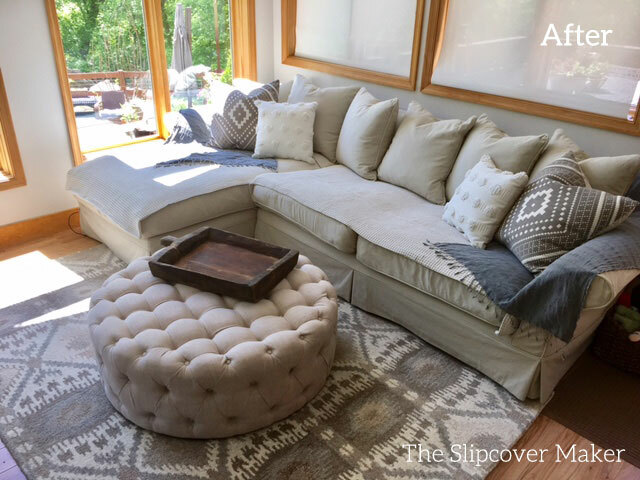 This entry was posted in linen, sectional slipcovers and tagged linen slipcovers, natural slipcover fabrics on August 20, 2016 by slipcovermaker.